With an abundance of builds and prices at Snyder Auto Group near Toledo, the GMC Sierra 1500 is a great option for anyone! This truck comes standard with 2-wheel drive or 4-wheel drive with options of a V6 or V8 engine. Whether you’re hauling a heavy load or just like the sleek look of the new design, there’s a Sierra model and package for you. If you’re a four-door truck kind of person, this is a package you’ll love. The Denali package offers LED lighting, chrome and color-matched accents, and premium additions. GMC’s Signature LED lighting is showcased with the headlights, taillights, fog lights and even the cargo lamp lighting on this GMC truck. The chrome grille, door handles, and side molding offer a powerful look, while the color-matched front and rear bumpers show the confidence this truck will give you. In addition to the two tire options, the Denali package offer seven different wheel options for a look you’ll love. GMC’s “three letter symbol for premium” holds up to it’s name with its ten-way heated leather seats, power adjustable pedals and remote start. The SLT package has 355 horsepower and 383 pounds of torque in addition to direct injection and variable valve timing. The Powertrain Grade Braking automatically uses the transmission to slow the truck while going downhill to maintain a constant speed. This braking system increases control of the vehicle and decreases wear on the brakes. This package continues its premium reputation not only on the interior, but exterior as well. The leather wrapped steering wheel and manual tilt and telescoping steering wheel column provide the utmost comfort while driving. The 8” Color Touch HD Radio offers bluetooth streaming, voice activation, and Pandora Internet Radio. Whatever it is that you’re listening to on the radio will sound incredible thanks to the six speakers conveniently positioned throughout the truck. The SLT package comes standard with 18” blackwall tires and 18” polished aluminum wheels. 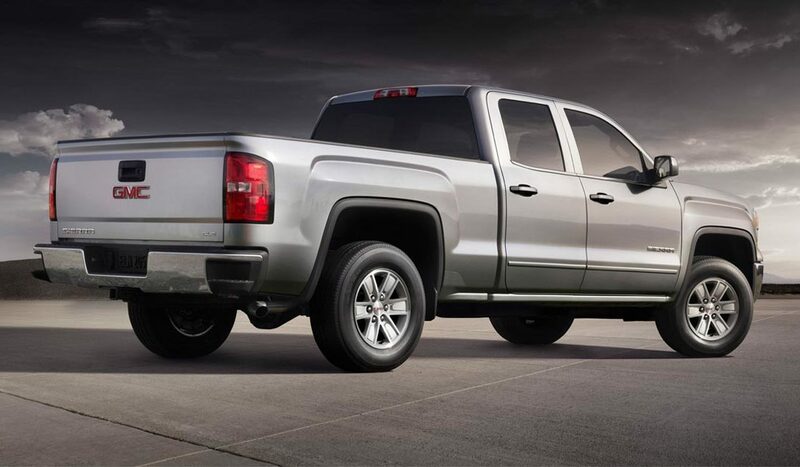 The chrome bumpers, grille and moldings give off the same confidence as the Denali model! This model now features the EZ-Lift and Lower tailgate capabilities to reduce effort on your part. In addition to the EZ lift and lower, the SLT model offers a lock and unlock button on the key fob for your tailgate. The standard package for the GMC Sierra is still one of the most incredible truck packages offered near Toledo with distinctive designs and exceptions capabilities. The CornerStep rear bumper is an innovative design that uses dead space on the bumper for easy access to the bed, even when the tailgate is down. The solar absorbing glass reduces harmful effects of UV rays and soaks up the infrared wavelengths that produce excessive heat within the cab. The 4.2” digital color display screen shows the radio station, song and artist information. The best part about the GMC Sierra 1500? All models come with four years of free maintenance and our price protection guarantee. Head towards Snyder Auto Group, conveniently located near Toledo, Ohio. Call Snyder Auto to schedule your test drive today!